Serena! I folded up the names on little peices of paper, and then had my husband blindly pick one that he felt most psychically connected to, and voila, it was Serena! Congratulations!!! 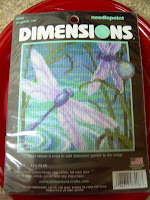 I hope you will enjoy your new dragonfly stitchery! Thanks, everyone, for playing...this was fun! I hope to do more of these as I discover more goodies around here that will be fun to give away! OK, this is pure silliness, but tonight I came across a needlepoint kit I had bought for someone, and they found it to have too small a thread count (they wouldn't be able to see it), so they found one with a bigger count! This one is a 14 count mesh, fully printed in color, with cotton thread, and an opal ribbon with iridescence to give sparkle to the dragonfly wings! I thought this would be fun for a giveaway. If any of you are into needlepoint, or know of anyone you could give it to, please comment on this post and I will draw a name on Friday night and mail it to you. I would rather send it to a friend who loves it, than take it to the Goodwill. You will have to be able to send me your address via e-mail if you win. I will notify you on your blog and leave you my e-mail address, on Friday night!!! I will get it in the mail on Saturday! Thanks for playing this fun little giveaway game!!! Well, here I am again on what is still Monday...with a second Cactus Monday post! LOL. It just so happens I stopped by Lowes tonight after work and found a couple of plants...this first one is called Titanopsis calcarea, otherwise commonly called Concrete Leaf Living Stone, or Jewel Weed. It is very unusual looking and has a nice soothing shape. I can't wait to see it grow...it is in a very small container right now! I posed these two new plants with my Buddha all dressed up for Fat Tuesday tomorrow! LOL. He makes a perfect backdrop! This second succulent (a cactus, mind you), is called Cereus forbesii monstrose. 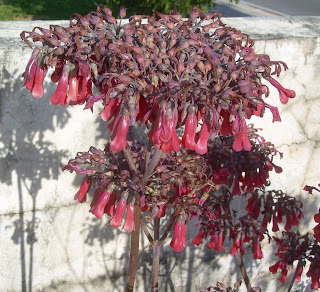 Cereus 'Ming Thing' is a very attractive monstrose form of Cereus forbesii. Forms myriads of sculptural blue shapes with very short black spines and woolly areoles. Excellent for windowsill or dish garden culture. Prefers shade or filtered light. It is fairly large specimen at this point...about 8 inches high! I love it...it is so odd looking...kinda like a bunch of melting candles fusing together if you ask me! I am so happy to be adding these two to my succulent collections! 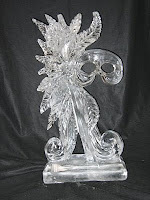 Beautiful ice sculpures of a cactus with coyote and one for Mardi Gras (this Tuesday)...or should I say Fat Tuesday! 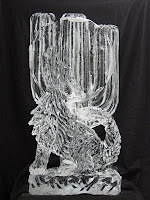 You can find more of these really cool ice sculpures at Innovative Ice. I did not have anything prepared for Cactus Monday...was blown away by Queen Latifah singing at the Oscar Awards show tonight and became quite overcome with sadness...her song was sung while showing all of the acters and actresses who passed away this past year, and I was surprised to be overcome with sadness over losing my own Dad even though it has been more than 10 years ago. I just think so much of Queen Latifah, and she sang the song just beautifully...it brought me to tears, and I actually had to leave the room for a while, I became so blubbery!!! It surely was unexpected, and it took me by surprise. I found this beautiful rendition of the song she sang, "I'll Be Seeing You", done a capella, and it is just beautiful. ENJOY! 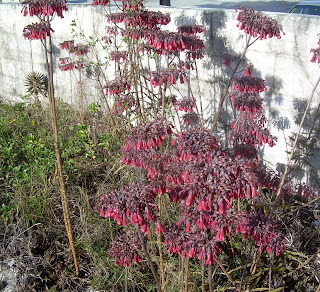 Pics of the wild growing Kalanchoe! OK, today I finally had my camera to take pics of the Kalenchoe that grows wild in a big neglected field a few towns away from me. I apologize that they are all sort of out of order, but I didn't have the time to rearrange them! 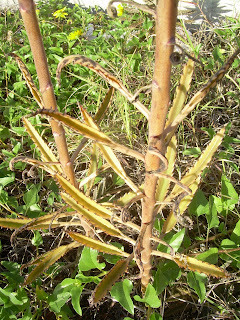 The long thin more yellow leaves belong to this plant! The plants growing out here in the wild have barely any leaves left on them and I had to search to find one that had this many, if you can believe it! Aren't the blooms so pretty close up??? You can't really see the brightness of the red color in the farther away pictures! 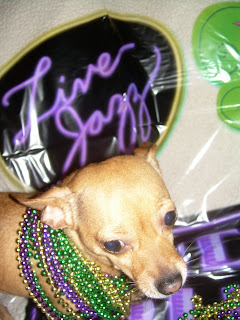 Fat Tuesday (Mardi Gras) is this Tuesday coming up! 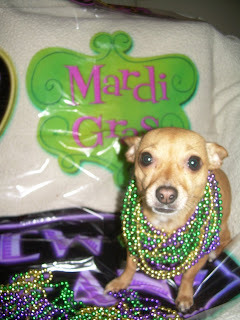 I had taken thease pictures of Doozey for a forum featuring pets, and thought you all might like to see her all dolled up to throw some of her beads during the Mardi Gras parade this Tuesday! I am going to go look for a King Cake (they used to sell them at our grocery store), to eat as well...delicious! So sweet and caloric...oh-la-la!!! I added a few more of my succulents in and it looks like a fun parade of Doozys and succulents! Hope your Friday night will be a lot of fun! We are leaving to go out for lobster at a new place, so hope it will be fantastic!!! Bye for now! Oh, God, such succulent (plant) love! LOL! Mr. Buddha had to come in for a little bath tonight! I wanted to show you my dark Buddha. My light Buddha is out by the succulent tires, but this guy sits in the screenroom, and I hate to tell you that he was covered with the little pellets that the nasty lizards leave around! Sadly! Well...not covered, exactly, but had a few around on his shoulders! LOL. Anyway, now he is all clean and pretty and emitting love again! Here are some pics I took tonight when I got home from work. I was encouraged to try and get a good shot of one of the aloe blooms, and I was actually successful! (Last pic). THe others are just all so pretty I had to show them. Have a wonderful Thursday evening and Friday! Just wanted to tell you that my succulent tires are looking kinda pretty in the winter sun here! 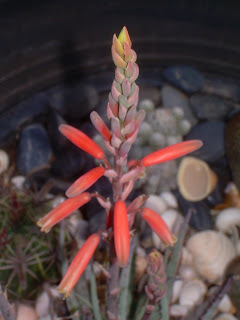 I have an aloe that has been blooming for several months now, some bright red jelly bean succulents, and due to this, it has my mind wandering to joining my local Cactus and Succulent Society! Unfortunately, it is located in Miami area (about 2 hours away), but they meet only quarterly...so if I can afford the gas to get there, I think I will go for it! Even if I can't get there, they will still send me their publication, Cereus Chatter. It is published quarterly and is a full color publication produced exclusively for members of SFCSS, Inc. Sounds like a fun thing! The next meeting is May 23-25, and it is a show and sale too! 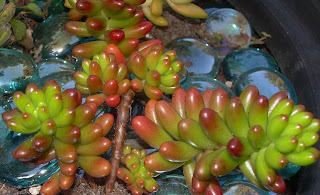 You can see some of their succulent plants HERE! I think I will try and be there! Last set of pics from wetlands! Here we are at the end of the Wakodahatchee Wetlands pictures...they are interesting and pretty, I think. Hope everyone had a wonderful Wednesday today! 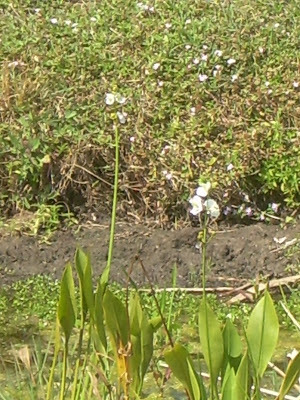 Floral/Plant life in the wetlands! Here are the floral/plant pictures from the trip to Wakodahatchee Wetlands! I loved this blue/purple colored iris-looking plant (only one I saw there)...growing smack dap out of the water! There are two pics of two different views of that flower! Those of you wondering how close we were to those alligators in the previous pics...we were at least a boardwalk level high from the water anyway...but the gators that were out a way...were about 20 feet away at least! Did I tell you that there are also iguanas and marsh rabbits out there too? I saw one of each, but they were too quick for me to get a pic! The rabbits are especially cute!!! OK...tomorrow will be the final installment of the views of the whole area (scenery). I ended up having to discard 2 of my spider pics because they were too blurry! Sorry. Anyway, these webs were very disorganized and there were several spiders of different types working on each one. The webs ran from the handrail of the boardwalk to the palm fronds, which, as you can imagine, was a very mobile place (with the wind blowing)! So, here is the 3rd installment of pics from Wakodahatchee Wetlands! The guy in the first and third photos looks kinda scary to me with that big humped up body with stripes! YEESH! OK...here goes for the 2nd batch of pics I took at the Wakodahatchee Wetlands. This first picture is the most fun...there were about 5 little turtles sitting on the tail of this alligator, who I suspect was a female lover to the male (I'm guessing here), who you see gliding through the water in another pic. The suspected male swam over to where the suspected female was lounging with the turtles on her tail. I kind of thought it might cause a movement or a big splash from one of the creatures involved, but alas...not a budge from anyone...all was well in the kingdom! You can make out what you are seeing in all of the other pics...you can see a turtle and a sort of teenage sized alligator basking over in the green sludge, which I have now learned is called duckweed. Just the looks of this bright green, succulent stuff makes me want to scape it off the surface of the water, bring it home, clean it and put it in a green smoothie! Hey...maybe I could go back to age 17 again!!! That is how nutritious this stuff looks! Tomorrow night I have either spiders and webs, or plant life with flowers! Which would you like to see next???? I'm going to a dance! A cheater Cactus Monday, and a weed walk!